Remember, we are writing the report in stages. If we write it a piece at a time, it will be very easy to finish at the end. First should be your introduction. The introduction should cover the purpose as well as an explanation that we will be doing the experiment in stages. Look through the slides to the right to see the necessary components as well as a sample introduction. For this portion of the experiment you need to select a visible light wavelength to observe your Kool-Aid solution at. This is where it is very useful to refer back to the Beer's Law Lab that you conducted and wrote about in your notebooks. You might even want to consult the simulator that we used because that is exactly what you will be doing in this procedure. Chose your wavelength based on the color of the Kool-Aid not based on the colors you got out of the chromatography. You need to explain how you chose your wavelength. Again, this logic will be in that lab you wrote up in your notebook. Bracket your wavelength +/- 50 nm on either side. For example, if you think the wavelength of the spectrophotometer should be set at 325 nm you would test a range from 275 - 375 nm. You will have to describe how to mix your Kool-Aid for the sample. See below for more information on how to do this. In your research you might see procedures explaining to pour solutions into a cuvette. Spectrophotometers can usually take cuvettes or test tubes. You will be using test tubes. Fingerprints are your enemy in spectrophotometry! 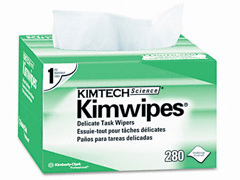 You will also have Kimwipes (spell it exactly like that. like Kool-Aid it is a proprietary name and needs the capitalization) to wipe the test tubes of fingerprints so include them in your materials and procedures. Spectrophotometers need to warm-up for 15 minutes once they have been turned on before you start making measurements. While I will do this step for you in order to maximize class time, you still need to make this one of the first steps of your procedures. After the machine is warmed up you will need to run a blank. A blank is the test tube that you are using filled with distilled water. This is to calibrate the machine to zero absorbance for water and your glass that it is being held in. This is the test tube you want to use for all measurements so that it remains a control variable. Once you have the spectrophotometer "zeroed," you can pour the water out. Rinse the test tube a couple of times with the solution that you are testing so that it is not diluted by the remaining water drops in the tube and then fill it. Wipe off the sides with a KimWipe again and take your readings. You will have to create a data table so you make a graph in order to determine the optimal wavelength at which to run your third experiment. This wavelength is what you will use for all of the third experiment. Mostly in chemistry we work in molarity when we are talking about the concentration of our solutions. In order to calculate molarity one needs to know the molar mass of the compound and in this situation, we do not know the molar mass of of Kool-Aid, which is a mixture of substances. In order to circumvent this, scientists will sometimes make a solution with the concentration calculated as a percent by volume (abbreviated often as % v/v) or a percent by mass (% m/m). Since we are working with a dry Kool-Aid powder, it is useful to make our solutions by mass, rather than by volume. This website does a nice job of explaining the different ways to calculate concentration. In order to determine your optimal wavelength, you will want to create a solution that is 0.20% by mass. You will want at least 50 mL of your Kool-Aid solution in order to run your tests. Review the following papers on chromatography. Based on that information, create a list of materials needed and write a set on procedures that is on your group lab document. Anything you use as research should be cited in your bibliography, which you can start now. You can see where it will go on your lab report based on the structure that I gave you in your document. My suggestion is to do a divide and conquer on the reading. Each of you review a resource and discuss the methods that were used. Think about how you can frame that for your own experiment. Brainstorm on whiteboards on the document or on whiteboards as needed. You will also need to devise data tables. These will go initially in your lab notebook, then they will be presented neatly in your final report. Ms. Cool's Chromatography Experiment for First Year Chemistry. Remember, procedures are due no later than Wednesday, though to be honest I will probably look at them sooner to help you out. Click here to see some writing pointers and some good things your classmates did. Check here to see the latest updates on deadlines and lab procedures.